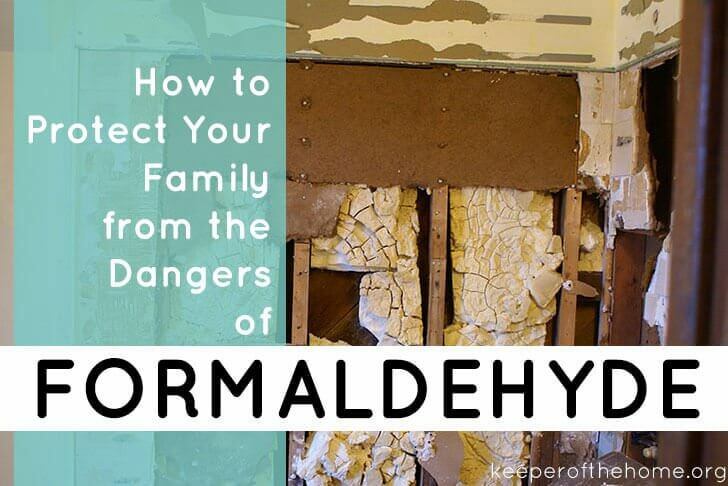 Formaldehyde is one of the most common toxic substances found in indoor air. It was only recently that I discovered just how pervasive formaldehyde is. No longer limited to mortuaries and medical laboratories (where it is used as a preservative), formaldehyde is now in many personal care products, furniture, and building supplies. 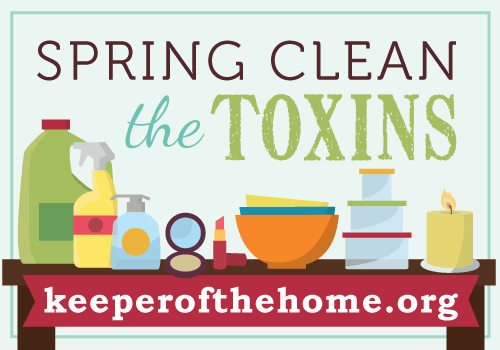 Since we spend so much time inside, it is important for us to learn how to reduce or eliminate this dangerous chemical from our homes. What is Formaldehyde and Why Should I Care? Formaldehyde is a toxic gas that is used to manufacture a myriad of products. One of the most bothersome aspects of formaldehyde is that it “off-gases” into the air, which means we inhale it. Overexposure to formaldehyde can lead to many health issues, including cancer. This short video succinctly explains the danger formaldehyde and what to do about it. Pressed wood products such as furniture and building supplies like particle board, paneling, and fiberboard. How Do I Know if There is Formaldehyde in My home? Since formaldehyde is in so many products, it’s a fairly safe bet that this gas is present in your home, especially if you have a lot of pressed wood furniture. If you wish to determine exactly how much formaldehyde is in your home, you can test the indoor air quality. There are many test kits available online which involve sending a sample to a laboratory for testing. 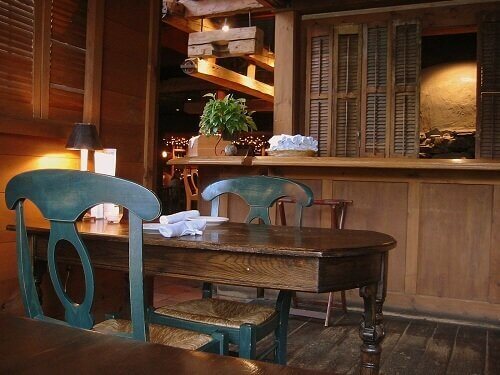 If you need to buy pressed wood products, chose exterior grade furniture or building supplies. Exterior grade pressed wood products are made with phenol resins instead of urea-formaldehyde resins. Phenol resins emit significantly less formaldehyde. The safest choice is to buy real, solid wood furniture. Buying real wood furniture can be much more expensive, I know, but do rest in the fact that it is much more durable and will last longer than pressed wood products. Also note that there are ways to find wood furniture for less: look at garage sales and thrift stores, learn to build simple furniture pieces, or find ways to repurpose real wood pieces you may already have on hand. One way we are getting around buying expensive shelving is to use wooden crates. For the past few months we have been using the weekly 40% off coupon at our local craft store (Michael’s) to buy wooden crates (they are made of pine). In the coming weeks these are going to become a huge bookcase unit in my daughter’s bedroom. I stumbled across this idea on Pinterest, of course. Airing the house is a good practice whether you suspect formaldehyde or not. Many toxic substances can build up, opening the windows gives them a good opportunity to exit. I suggest airing out the house as often as possible. 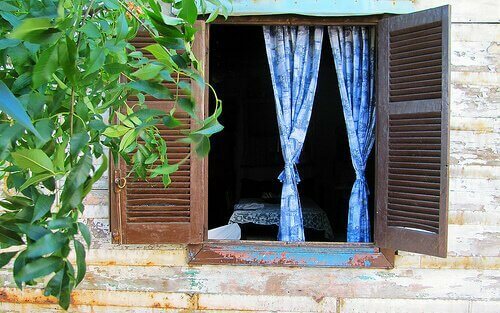 If the weather is cool, air out one room at a time by opening the window and closing the door. Formaldehyde emissions increase as temperature and humidity increase. Keeping your home on the cool side will help prevent formaldehyde “off-gasing” from furniture and other household products. 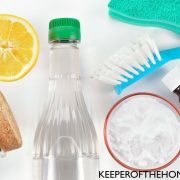 Making your own cleaners you will save money and give you the freedom to let the kids clean without worrying about exposing them to harmful chemicals. If you do have any type of commercial cleaners, store them in a well-ventilated area that is away from your main living space, such as the garage. Get Plants. Lots and lots of plants. Plants are excellent air purifiers and should not be overlooked. In fact, plants are one of the most effective ways to remove harmful chemicals from indoor air. Ferns are thought to remove formaldehyde most effectively. Chrysanthemums are also very good. 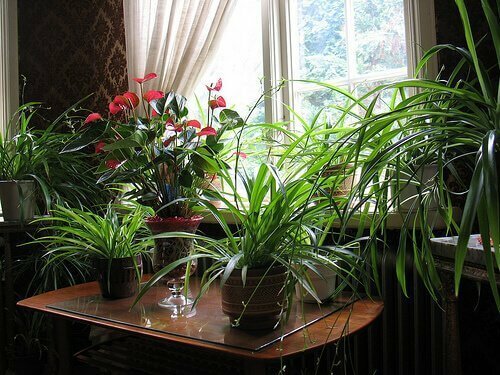 Other plants that are great air cleaners include: spider plants, tulips, philodendrons, palms, and ivy. For more details on how to use plants to clean the air, see Stephanie’s post at Simple Homemade: Using Houseplants to Reduce Toxins and Grow Fresh Air. This step may not be necessary, especially if you have older furniture and lots of plants. However, if I were moving into a brand new home, I might consider this option. Not all air purifiers remove formaldehyde. Here is a listing of air purifiers that remove formaldehyde. Is formaldehyde a concern for you? What steps are you taking to eliminate or reduce exposure to formaldehyde? Living Simply Saturday... but you won't find it here! Living Simply Saturday: Enjoying my vacation! Next Post: He is Risen! I was fortunate that I did not have allergies of any kind for 37 years. Then I moved to New England from the South and started developing skin allergies. I was so surprised when the allergist tested me and found that formaldehyde was one of the biggest triggers. I quickly educated myself on all the myriad of names of formaldehyde releasing agents and began purging my house of nearly all chemicals, personal care products, etc. Now I make most everything I need from recipes I find on the wonderful blogs like yours. My skin rarely flares up now, no more itching, and my eyelids no longer are red and peel. Amazing that formaldehyde is in nearly everything. One other comment: in the 80s houses began to be built so tightly that the natural airing out process disappeared. Our drafty 1926 house is really a blessing. 🙂 Your suggestion to air out the house is so important. Thanks for a great post! Wow! 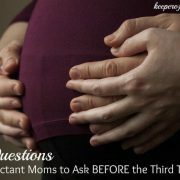 I had no idea about any of this!! Thanks so much for posting. Scary stuff. We attempt to only buy real wood furniture and I LOVE having the windows open. 🙂 Now, I just need to work on the plant thing – considering I have the Black Thumb of Death, that might take some hard work. Ha, ha, Stacy. I am with you on the black thumb. For some reason my indoor plants have survived. There are some that are harder to kill than others. When I wrote this post I totally forgot that I had shared about the houseplants in my home on my blog! Here is the post that shows the plants I have: http://adelightfulhome.com/adding-peace-and-joy-with-houseplants/ (and I haven’t killed any of them). There is a link to the best plants for beginners, too (i.e. Plants you can’t kill). You say particle board is a cause of these gases. Is it possible that our new floor “wood” bamboo, but then it is layered with pressed board to make up the rest of it is putting off these harmful fumes into our house? I guess if so I should really be opening the windows daily until it get to hot and then turn on the AC to help out. I will definitely be going out to get some plants to help too. Thanks for the great information. I am always learning new things and want to keep harmful things away from my family as much as possible. Whenever anything smelly gets spilled on the carper I shake baking soda over it and let it sit a while. Baking soda helps absorbs odors. Once it’s dry you can vacuum it, or scoop it up into a dust pan. 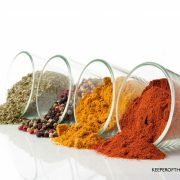 That is so interesting about your skin allergies! 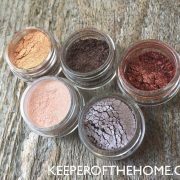 I’m glad to hear you have been able to take care of it by using natural products and removing chemicals. You also make a good point about how air tight our homes are! Many of our advances have drawbacks, don’t they? Formaldehyde is also in fabrics you purchase at fabric stores (like JoAnn’s). I recently made myself a dress and didn’t wash the fabric ahead of time. Every time I went to sew or work on it, I noticed that after a while my eyes and throat would burn noticeably and my nose would get runny. This would all go away after I quit working with the fabric. There are actually warning labels on the shelves at the fabric store (I live in CA where there are warnings on so many things) that indicate the calico fabrics contain formaldehyde. From now on, I’m going to wash the fabric first!! Our windows are always open here. In Hawai‘i a lot of people don’t have air conditioning if they live at higher elevations, so we just let the fresh air in all of the time. It’s quite nice. When I have to go somewhere with air conditioning it’s a bit weird. I stayed with my family on the mainland a couple summers ago and I really was not used to that lack of fresh air. It made it hard to sleep actually. Sitting in the library at the college, or in the classrooms, makes me really want to crack a window. I just love fresh air! I purchased a new vehicle three years ago. I know, not a good move for one who is concerned about formaldehyde, as I am. It was in April, so I left it sit in the sun with windows opened just a crack. I thoroughly vented it before driving (with windows open partly) if I could. By fall, odors had been diminished. I think I am pretty sensitive to it, so anytime I detect odors or irritation, I ventilate the house, or allow items to off-gas before bringing them in the house. Eliminating it completely is difficult. I do much of what you’ve suggested, as well. Same thing with the plants. I know they help, but I can’t keep them alive. I am one of those unfortunate people who has a strong formaldehyde allergy. 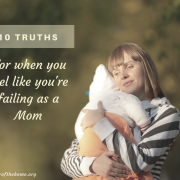 It began when I had to wear leather combat boots and a rash formed on my shins. Then I began having rashes on my ring finger (weird, right? ), on my upper arms, on other parts of my legs, etc. After taking the T.R.U.E patch test, I found out I was allergic to this chemical that I thought was for embalming. But no, it was in every liquid product the US consumes. I clean with the natural cleaners, dish detergents, liquid hand soaps, lotions, make-up, shampoo, conditioner, laundry detergent, new clothes are first washed several times, carpet gets cleaned with just water, and my husband and kids have to use the same products I use as well. Going to a day spa or mani/pedi has me frustraited because I get the same line from the gals who are trying to sell me things, “our items are formaldehyde free.” Then I have to show them what to look for. Regarding the awesome crate bookshelf… I’d like to build something similar for my 4yo daughter’s room. On the site you pinned from, it doesn’t offer any instructions, just the photo. Do you think you’d somehow bracket the crates to each other and to the wall? Any pointers on constructing this? Thanks!! It actually talks about using brackets to attach the crates to one another and to the wall. Great informative post Stacy! Formaldehyde is also found in certain vaccines which is another reason to avoid them. On a college tour at a science fair regional, after being in a room with formaldehyde (biology lab) my son nearly passed out. I barely managed to get him out of the room. After struggling to get him to the car, he threw up and was very ill the rest of the day, even with a headache. Come to find out, his father passed out after being exposed to formaldehyde (biology lab) back in college. No doubt it was the formaldehyde. I didn’t know that formaldehyde is such a danger! Thanks for this nice posting, Stacy. 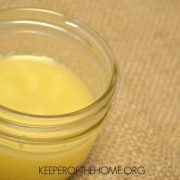 For me this is also another reason why to continue in using homemade cleaning products. I got to know about them only recently. I have always despised spring cleaning, but this year I decided to print a complete list with spring cleaning tips and was surprised that it actually helped me not to get crazy again because of all the cleaning mess. There, I have also found recipes for homemade cleaning products. They are surprisingly effective and one can easily make these healthy cleaning substances that can easily beat commercial brands. Try them for sure! I was so just planning on purchasing something similiar to what you are making like the large cubicles that are attached for books and misc. stuff in my girl’s room–off course it would have been pressed wood! Thank you so much for your post now I will go another route. maybe like you are doing with the crates!! I recently bought a entertainment center from walmart made if fiber borad .. and my allergies are going crazy along with my 6 year old sons ans my 4 month old daughters allergies .. I also bought him a bunk bed not sure if it fake wood but our allergers are going off the.wall help me !!! Can it be the fake wood causeing this ?? Thanks for the share Ann. It really is important to make sure your home is safe from those hidden dangers. Those allergies can really become life threatening to kids.